One of the most important ways to be happy in life is to get really clear on your personal picture for success. I was speaking this afternoon with a client who, by any typical measures, would be considered a raving success. Now all my work is confidential, so I can’t give too much away, but suffice it to say that I would describe this individual as a published author, a chief executive officer of a company with nationwide impact, a person who has conquered a disease that disables or kills most people who get it and most importantly a person who has re-created her life in a way that serves her soul. I think that’s enough to keep her identity confidential but still give you an idea that she is by most people’s measure, really quite an accomplished, amazing individual. I know I feel privileged to work with her. And yet she still was afraid of failure, a common fear of most people. Fears are a combination of our thoughts and our emotions. We can be afraid of failure and we can also be afraid of success. A lot of times when we feel failure it’s because we are judging ourselves by other people’s standards and not our own. The truth is that we all want different things, thank goodness. The world needs all kinds of people to be all different kinds of success. Thank goodness my gardener Gabe Horrisberger didn’t want to end up on the U.S. Supreme Court because I appreciate what he does in my garden. Thank God my yoga teacher Lillah Schwartz decided some 33 years ago that she loved yoga. Thank the Lord Sue Maes, my mentor in healing, was born cross-eyed so she could become obsessed with natural healing. I am so blessed that my dear departed professor from Brown, Kermit Champa, decided he wanted to be an amazing teacher. Had each of them not been who they were meant to be, my life would be a totally different story. Somehow my own picture of success is a blessing to other people, in large and small ways, because I never wanted to be a Hollywood movie star, a lawyer, a fashion designer, a chef, a Wall Street tycoon, a research scientist or a medical doctor. Not that there is anything wrong with these pictures of success. Everybody serves in their own way. When we don’t get clear on our own picture of success, we often end up measuring ourselves and our lives by other people’s standards. “You care for nothing but shooting, dogs, and rat-catching, and you will be a disgrace to yourself and all your family, ” Dr. Darwin once wrote to his young son, Charles Darwin. Thank God Charles Darwin got obsessed with barnacles and had the gumption to do something different, taking a ride on the Beagle in 1833. When we measure ourselves by other people’s yardstick of success, we may not only miss out on following our own dharma, we can make ourselves apoplectically miserable. This is often a young person’s dilemma that occurs when he or she is compelled to follow in a family tradition. I was never as depressed as when I was a Savannah debutante at age 19. Somehow I knew deep down that my life would not center around curling my hair every weekend, wearing fancy ball gowns and making small talk at large social gatherings. It just wasn’t me. So how do you get clear on your own picture of success? Take out a blank sheet of paper. Then draw lines like spokes of a wheel coming out from the circle. On these lines, write down the key ingredients for your own personal happiness. These are the key elements that you want for your own life, for your own business. Take all the time you need but make sure the information comes from your own heart and soul, not from anybody else. If you have been reading my blog, you already see my picture of success. The butterflies. My garden. The jewelry I make, the shawls I knit, the books I write. 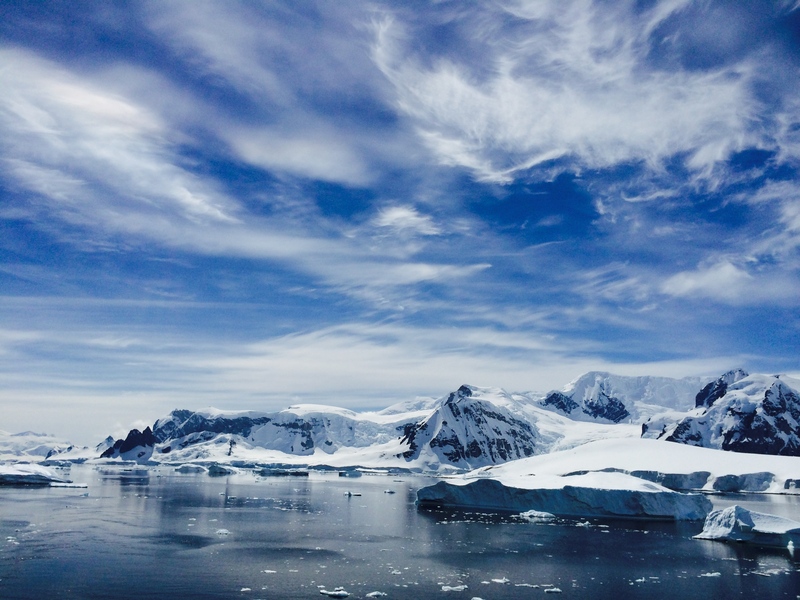 The sublime pictures of nature, including this one that I took from the veranda of my room on my recent trip to Antarctica. Before I left, I told a friend excitedly that I was off to Antarctica to visit the penguins, and he laughed out loud. “You really know how to pick them,” he said. A vacation to the coldest continent on earth was not his picture of success. Even my compost pile is in my success picture and on this blog – I consider natural recycling to be important part of my picture as I would like to be conscious of all I leave behind for posterity, literally and figuratively. Give yourself permission to create your own picture of success and discover that you have a right to your own version of happiness. And that’s the gift you give not only to yourself but also to the world at large.